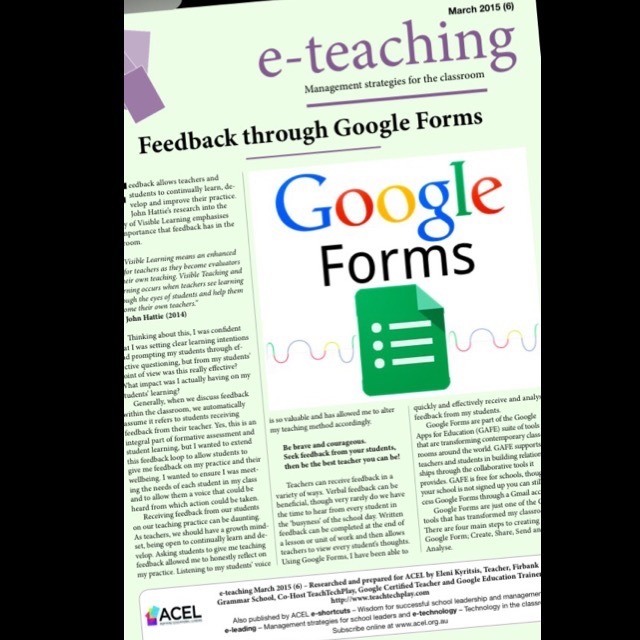 Earlier in the year I was asked to write an article for ACEL (Australian Council for Educational Leaders) looking at how I use Google Forms in the classroom. Feedback allows teachers and students to continually learn, develop and improve their practice. John Hattie’s research into the theory of Visible Learning emphasises the importance that feedback has in the classroom. Thinking about this, I was confident that I was setting clear learning intentions and prompting my students through effective questioning, but from my students’ point of view was this really effective? What impact was I actually having on my students’ learning? Generally, when we discuss feedback within the classroom, we automatically assume it refers to students receiving feedback from their teacher. Yes, this is an integral part of Formative Assessment and student learning, but I wanted to extend this feedback loop to allow students to give me feedback on my practice and their wellbeing. I wanted to ensure I was meeting the needs of each student in my class and allow them a voice that could be heard and action taken from. Receiving feedback from our students on our teaching practice can be daunting. As teachers, we should have a growth mindset, being open to continually learn and develop. Asking students to give my teaching feedback allowed me to honestly reflect on my practice. Listening to my students’ voice is so valuable and has allowed me to alter my teaching method accordingly. Teachers can receive feedback in a variety of ways. Verbal feedback can be beneficial, though very rarely do we have the time to hear from every student in the ‘busyness’ of the school day. Written feedback can be completed at the end of a lesson or unit of work and then allows teachers to view every student’s thoughts. Using Google Forms, I have been able to quickly and effectively receive and analyse feedback from my students. Google Forms are part of the Google Apps for Education (GAFE) suite of tools that are transforming contemporary classrooms around the world. GAFE supports teachers and students in building relationships through the collaborative tools it provides. GAFE is free for schools, though if your school is not signed up you can still access Google Forms through a Gmail account. Google Forms are just one of the GAFE tools that has transformed my classroom. There are four main steps to creating a Google Form; Create, Share, Send and Analyse. For the purpose of collecting feedback from my students I like to select ‘Automatically collect respondents username’. With this selected, students do not need to enter their name or email address. They are under the impression they are completing the Google Form anonymously, yet the form will automatically collect the student’s details for me. This allows students to be honest in their feedback, and allows me to view and monitor each individual student’s needs. You are able to email the Google Form directly to students or you can provide students with a link to the form (I like to customise my shortened links using the bit.ly chrome extension). Students then type the link into their browser and are able to complete it. 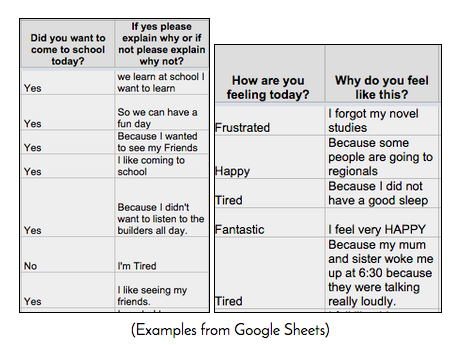 There are three main types of Google Forms I use to help analyse student Feedback. These Google Forms can be given at the beginning, middle or end of the lesson or unit of work. Exit Tickets provide me with information related to a specific lesson. This Google Form can be given to students to complete at any time during the lesson. It provides me with explicit information on what students have learnt, what they liked and disliked about the lesson and ways they think I can improve. My teacher made the learning intention clear to me? What was the learning intention today? I like how my teacher….. I found ______ useful, because….. Using Google Forms for Student Reflections provides feedback from students in relation to what they have learnt and the effort they put in during group work. I found that some students did not have the confidence to approach me as the teacher to tell me that others within the group were not contributing. Using these Student Reflections has helped me identify how each student has worked in group tasks and explain what value each group member was really having so I can further support students as needed. How do you feel your group worked together? I have designed my Student Well-Being Form to provide me with information in regards to how each student is feeling from day-to-day. As educators, we know it is difficult to get around to every student each morning to ask how they are feeling. I want to ensure all students within my class feel they can share information with me. This Google Form is completed by my students 2 to 3 times a week. The Student Wellbeing form is extremely helpful as it enables me to identify how each student within my class is feeling and why. It has allowed students to share information they may not mention when verbally asked. Did you want to come to School today? If yes please explain why or if not please explain why not? Are there any problems on the yard? If yes please explain what is happening? 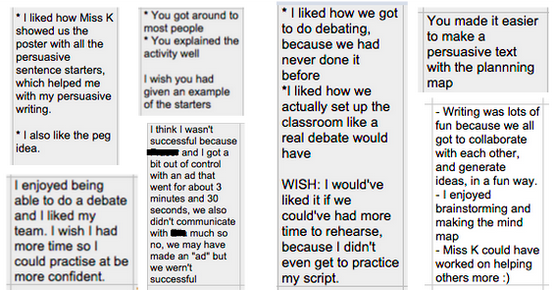 In the beginning I found that my students did not express themselves with confidence when completing Google Forms. It took time until they developed the confidence to share matters occurring in the classroom, at home or in the playground. 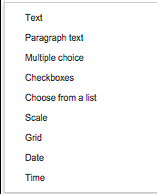 Each time students completed a Google Form, I would ensure to reflect back to them on what I noticed. This made the students feel more confident and allowed each student within the class feel they had a voice that was being heard. Using Google Forms to receive feedback and student reflections has really transformed my classroom and students thinking. It has allowed my students to recognise that we are all learners no matter what your age. As a teacher your students are one of the most valuable assets. Their feedback does not only inform their own learning journey but the teachers learning journey too.